Yes, 8 designs! I guess I should try and keep this short. If you would like to know any details about anything here, just let me know in the comments box. I'm going to get right to it. Day 8 - Food. I made use of one of my new Barry M Gelly's : Coconut, for the base of my strawberries and cream nails. I also used Princess plates 08 & 10 and Pro 03. Day 9 - Superheros. Spiderman was my feature here, and another new Barry M Gelly out on show - Damson, it was perfect for this. Day 10 - Geometric. This was my second attempt, deciding to keep it simple and bold. I used the cross on Roxy 01 for the squares, stamping with Essie - Liquorice. Day 11 - Cupcakes. Pro XL 07 gave me the stamp for the cupcake which I ever so carefully painted in, matching the wrapper to my other striped nails. Featuring Barry M Silk - Meadow. Day 12 - OOTD. Houndstooth dress and a red and gold patterned jacket? Looks better as clothing. I used Pricess plates 09 & 10 and Pro XL 07. Day 13 - Childhood. And once again I looked to my children for inspiration. My youngest daughter loves balloons, so I adopted the stamps to look like this. I used plated 08, 09 & 10 from the Princess collection. Day 14 - TV Shows. This one is based on Monster High. I modified the stamp designrom Princess plate 10, to look like the logo. There's that Damson from Barry M again, used to stamp over a lighter blue. Day 15 - Love. It's all hearts and sparkly polish here. I'm loving my new Glam Polish - Coven. Finally managed to get my hands on it. Love it! That's probably as short as anyone could make a post on 8 different mani's....... Sorry about that. 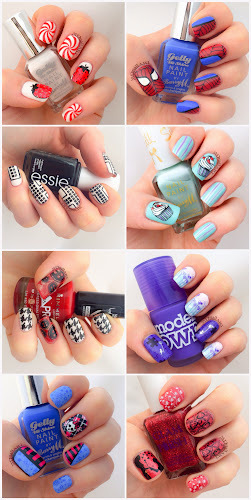 I just find that stamped nails doesn't really need a whole blog post for just one, although I'm pretty pleased with a few of these. And if I'm totally honest, I'm quite enjoying seeing mini collections in a collage like this. If you want to view these individually you'll find them on instagram.